The fulcrum is the point about which the stick pivots, when it is allowed to do so. Oftentimes, the stick operates as an extension of the hand, but it is afforded some wiggle room to resonate when it strikes the drumhead. The parts of your hand that hold on to the stick even when it uses that “wiggle room” constitute the fulcrum. Some people strictly define the fulcrum as being between the thumb and forefinger. Others encourage you to “feel” the stick more towards the “back” of the grip (I.e. more in the other fingers); this could be a conservative adjustment allowing the middle finger to share some of the burden with the “front fingers,” or it could be a true “mid” fulcrum using the ring and middle fingers (popular with drum set and especially with Moeller-style technique). The true front fulcrum is easy to define and enforce. 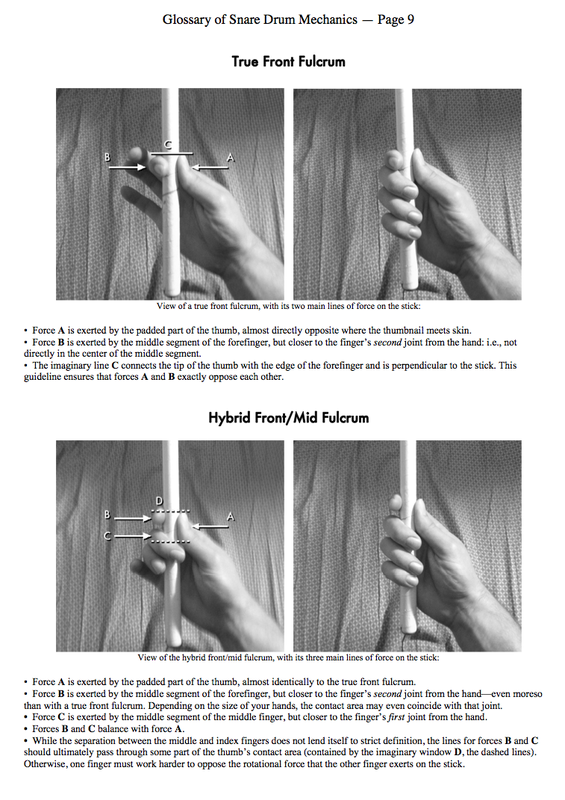 The Hybrid Front/Mid fulcrum aims to gain some of the benefits of the more old-school mid fulcrum—forcing you to apply more wrist turn (power), and also easing some of the burden on the small muscles in the front fingers—while making available some of the speed and finger assistance afforded by a front fulcrum. As a player, I like the front thumb/forefinger fulcrum. It allows the most speed, and if you use a more mid fulcrum most of the time, you will have to change your fulcrum for the fastest multi-stroke figures. It is best to just be comfortable with having the same fulcrum there—all the time—for a focused, consistent sound all the time. As a teacher, I like the thumb/forefinger front fulcrum even more. Unless you have very mature performers on your line, trying to teach a mid fulcrum just leaves too much room for students to not understand how their hands are supposed to operate and not give off obvious visual cues of what they're doing wrong (e.g., the gap size between forefinger and middle finger and how the thumb splits it). You need strong, developed fulcrums in order to truly control multi-stroke spacing, which is absolutely crucial to roll cleanliness. It's really hard to build this muscular awareness in students who can't be held to a strict standard of how their hands are supposed to look. I have tech’d for caption heads who prefer both styles, and I’ve had success with both, but my general feeling is that unless you are working with very mature players across the whole line, defining a mid/thumb/finger fulcrum works against building uniformity, quality, speed, and cleanliness in the limited time afforded by the activity. I see why people do it, but I think when you can only fight so many battles, the true front fulcrum offers the best payoff for the effort and the best framework for getting students to hold themselves to well-defined drumming mechanics. This is the North Carolina State arrangement of A Milli that they still play during games and to conclude warm-ups.